Blackjack is an exciting casino game whose house edge can be significantly decreased by using a strategy. At the beginning of every game players are dealt two initial cards which can happen to be a pair. Such situations can be very tricky and how you tackle them defines you as a player. At some point during the game, you are bound to get such a hand which can be very beneficial for you, however as long as you know how to take advantage of it. Depending on the number of decks involved in the game, your chances of getting a certain pair differ. In blackjack, the first thing that comes to mind when we think of two cards of the same value is to split them in order to form two new hands. While it is true that in some situations this move has proven to be very beneficial, there are some cases in which it is best to avoid splitting. Let’s have a look at some of the tricky pairs that you can get while playing blackjack and how to cope with them successfully. In blackjack, there are two pairs which you should refrain from splitting in any case as if you do so, you will most likely lose or end up in a worse position than before. In general, you should split your hand only when you have a decent chance of making two strong hands. This is the reason why when you get a pair of 10’s or 5’s, you should avoid this move as it will only place you in a disadvantageous position. The hand that consists of two 10’s has always been a centre of attention to many dedicated blackjack players. Over the years, many heated discussions regarding this matter have been conducted as this pair has proven to be rather tricky. Most gambling experts advise that whenever you get two 10’s, it is best to never split them. Instead, you should always stand, regardless of the up card of the dealer. The reason why is that this is one of the best hands in blackjack that you can possibly get and if you split it, you simply ruin your chances of winning. Surprising as it may sound, a pair of 10’s is one of the most misplayed hands in blackjack due to the fact that many players fail to see through it. The fact that the average winning hand is estimated to be 18.5 points and that the aforementioned pair totals twenty clearly indicates that your best move is to simply stand. It is almost impossible to improve such a beneficial hand and if you decide to make any other move, you will most likely lose. In most cases, having a total of twenty is sufficient in order to beat the dealer and therefore, the best you can do in such situations is to simply let the game reveal itself. The other hand which you should never split consists of a pair of 5’s and this combination also requires a different approach. The reason why is that if you split it, you will most likely end up with two hands whose chances of getting a decent total are very low. Also, initially when you are dealt a pair of 5’s, your hand totals ten which gives you a fairly good start of the game. However, if you split this hand, you will simply make two weak hands out of one strong. This time instead of splitting, you should double down and hit, depending on the up card of the dealer. If the up card of the dealer is from two through seven, you should double down due to the fact that he is in a weak position and you should try to make the most of this situation. This way you have the chance to increase your wager when the odds work in your favor. If the dealer shows an eight, a nine, a ten or an ace, then it is best to hit and try to improve your hand. Besides your two initial cards, you should also take into account the up card of the dealer and make your move based on these two factors. Unlike the cases in which you have a pair of 5’s and 10’s, there are some situations which always require splitting. For instance, whenever you have a pair of 8’s, you should split it in any case. The position of many proficient gamblers towards such situations is that this pair should be always split, regardless of what the dealer is showing, however this combination is considered to be one of the trickiest hands. It is really important to take your time to consider the possible outcomes of this pair as your ability to tackle such challenging situations defines you as a player. Having a pair of 8’s in your hand gives you a total of sixteen. On the one hand, this total won’t be most likely enough to beat the dealer, taking into account that the average winning hand is 18.5 points. On the other hand, if you attempt to improve it by getting one more card, your chances of going over twenty one and busting are too high. The position you are in is very disadvantageous and it should be considered carefully beforehand. When you split this pair, there is no guarantee that the two new hands will form a good total, however it is perhaps your best option. Another hand which is recommended to be split consists of two aces. The ace is the most powerful card in the deck and therefore, whenever you have such a pair, it is essential to know your best move. If you know how to proceed in such challenging situations, you will be able to get the most out of every game. This card combination is considered to be rather complicated and tricky as it offers you different possibilities and odds. In general, you should always split this pair, unless the dealer shows a nine, a ten or an ace as in such cases, your best option might be to hit. The reason why you should split when the dealer’s up card is from two through eight is that in such situations, he is considered to be in a disadvantageous position and thus, you should apply a more risky approach. However, if you split a pair of aces whenever the dealer is showing high-valued cards, you are most likely to form two potentially losing hands. 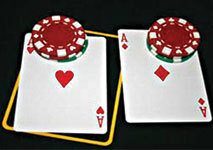 Blackjack is a card game with many different variations which are just as widespread and popular as the classic game. These versions use the same basics as the original game, however they also have some additional rules and features. One of the rules which can vary, depending on the blackjack variation and the casino concerns splitting. This is the reason why you should always double check the rules of the game in advance in order to make sure they are not altered in favor of the casino. However, other variations have certain restrictions when it comes to splitting on the number of times or on the type of cards that you are allowed to split. You should also double check whether doubling down after splitting is permitted and whether you are allowed to split aces. In general, if you are deprived of the option to split a pair, this increases the house edge by approximately 0.57%. If splitting aces is not allowed, as you might gather, this also works in favor of the casino as it increases the house edge by 0.10%. In case that you are allowed to re-split aces, this is beneficial for you as it gives you an advantage of 0.32%. Some games allow splitting on any two cards and you are permitted to do so as many times as you wish. While playing blackjack, one of the hands which you will inevitably get at some point during the game, consists of two cards of the same value. If you want to be able to handle these cases successfully, you should be prepared in advance. It is highly recommended to learn all of the outcomes of the possible moves in order to know which one is your best option and which one you should avoid. For instance, when you have a pair of 10’s and you know that your chances of busting are incredibly high if you hit, you will avoid this move.